Do those Justinian II Solidus coins look different? Re: Critical Summary 3.0, pages 16 & 17. Can we go back to comments by Hugh Farey and Nabber on 10/22/15 & 10/23/15 and to something I wrote 7/9/15? In the last two paragraphs of section 9.1, Jackson and company portray some very dubious information as though it was based on an important study. I love Fanti, but ask any art student and they will tell you this is simply how any artist might draw a neckline. Trying to compare it to an almost invisible wrinkle that may well be a modern day wrinkle is like looking for elephants in the ephemeral clouds. And if I buy this the authors have a bridge for sale. Right? 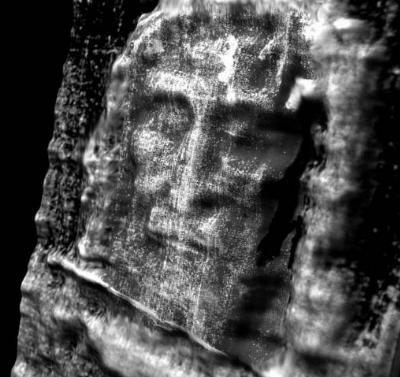 In 2015 Giulio Fanti and Pierandrea Malfi co-authored an important book entitled: The Shroud of Turin: First Century after Christ. The book includes a long and detailed chapter devoted to the numismatic investigation of the Justin ¡an II 692 solidus as well as other coins bearing an image of Christ. The authors provide an in depth presentation of the tight correlation between the Shroud and the numismatic characteristics of the 692 solidus coin. Their study includes an exacting evaluation of an extensive list of "coincidences" that echo and build on the Vignon and Pfeiffer characteristics. 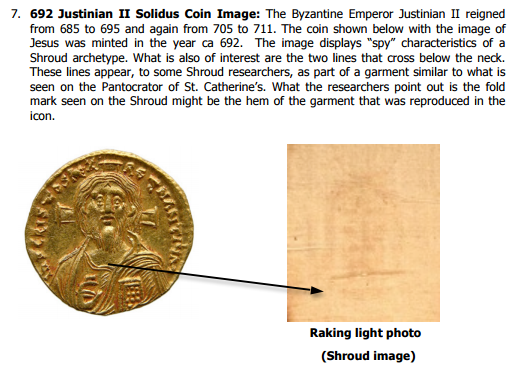 They performed a statistical evaluation on the whole set of "coincidences" and report In their study a certainty greater than 99.99% that the Shroud was the model for Justinian’s 692 gold solidus coin. We have shown the 692 Justinian II solidus coin with a photographic negative of the Shroud face (body image). The negative image, which was not available until the year 1898, could not have been the archetype for the coin. The actual faint Shroud image had to be the archetype according to Fanti and Malfi. But the negative shows more clearly for our purposes an Interesting "macro-characteristic" of the Shroud that is visible only on close visual inspection of the actual Shroud cloth. In the negative it is an easily observed "characteristic" illustrating the detail and care that must have been taken by the coin engraver. The arrow points out this feature. It is a subtle double fold in the cloth just below the neck. In their book Fanti and Malfi have pointed out how this double fold is interpreted on the coin as the hem of Jesus’ garment. And it went back and forth. The above picture may help. To see what BT wrote in July, let’s here simply repeat the blog posting from then: Byzantine Coins Again. by which I am persuaded the shroud is much older than its carbon dating suggests. Is John Jackson and company pointing to something lower down? There are many depictions of Christ on Byzantine coins with features that correspond to features on the shroud. But then there are the exceptions. Then too there are the questions about whether those features are really features at all. This solidus is an exception. Look at the hair and beard on Christ. Yet the common motif of two parallel curved lines at the neckline of Christ’s shirt is maintained. It also raises questions about the motif of parallel lines in the neckline of the garment. Fanti on page 113 of his new book compares the neckline on Jesus’ “dress” (shirt) to a “wrinkle on the neck (double-lined)” on the shroud. This is so for many solidi. But in this one we find this very same feature on the neckline of shirts worn by Justinian II and his young son and co-emperor Tiberius. It is a common way of drawing a hemmed collar on a shirt, is it not? I always thought it was the more visible wrinkle. Was I wrong? Is John Jackson and company pointing to something lower down? It makes sense. The coins of Justinian II’s first reign (685 – 695 AD) are indeed remarkably shroud-like, and it is difficult not to think it was indeed the model. However, when, after a period of exile, Justinian returned to the throne (705 – 711 AD), the same sort of coins (with the same designation – Christus Rex Regnantium) have a closely shaven Christ with tightly curly hair. Can anyone suggest why the changed their mind about Christ’s appearance? I think the Byzantine solidi are a meaningful part of a larger historical picture by which I am persuaded the shroud is much older than its carbon dating suggests. Note: Critical Summary 3.0 has updated the picture used from 2.1. Here it is. Do those coins in 2.1 and 3.0 look different? 1. The Constantine VII 945 AD coin had two unmistakeable signs of the Shroud: the distinctive “Lock of Hair” (hair as seen by several artists), an exact match to the “3” blood-mark on the forehead of the Shroud man; and the swollen cheek. Two other things add less convincing matching: the similar beard and the hair parted in the middle. 2. Constantine VII almost certainly had seen the Shroud image as full-length. 3. Constantine VII knew the Shroud body image was naked. 4. Therefore, Constantine VII knew the “wrinkles” below the neck on the Image were not part of a tunic. 5. Constantine VII commissioned the image of Christ as clothed, and merely added the wrinkles below the neck as a typical tunic feature, as used before on other images in other times. 6. The “3” mark plus the swollen cheek taken together are a sure lock that the Shroud was the model and therefore the Shroud existed well before the Middle Ages. 7. The wrinkles are probably a distraction in this whole argument. Personally I find the swelling pretty convincing. If you look at the 3-D images of the Shroud in the facial area the swelling is exactly the same in the two areas on the coin. It does look good, doesn’t it; but there are dozens of these coins about, and it is worth looking at them as a whole before deciding that any particular bump is more than wear and tear or an irregularity in the mould. 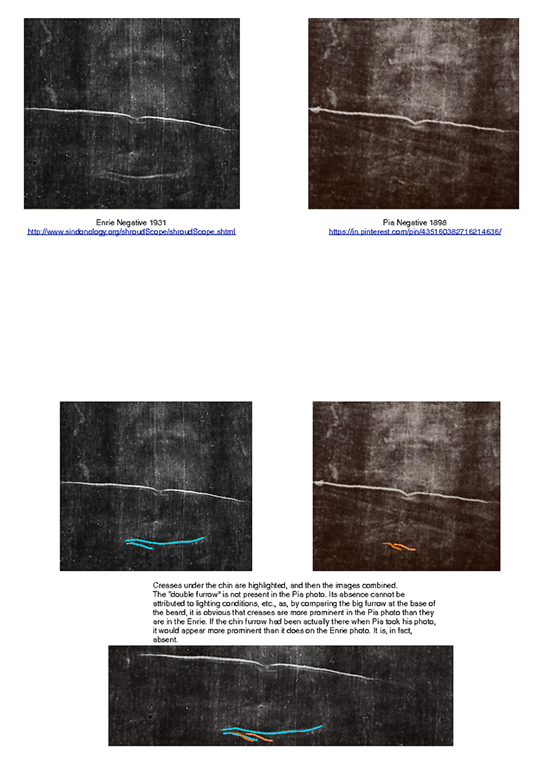 This one: http://www.ancientresource.com/images/gold/christ-gold-18474b.jpg, has a bump on the other side, for example, but most of them have no bumps at all. Well of course there is always other possibilities but on the coin in the left cheek there is this bump and then slightly diagonally from it there is the swelling under the right eye just like the Shroud. Is it really likely this is just a coincidence? I don’t think so. This is an image you can use to compare http://1.bp.blogspot.com/-y8rPtWSKPJs/UfeyoftSeAI/AAAAAAAAB0A/rUMNeCYxe0Q/s800/3D_faceMarioAzevedo.jpg Then of course its not just this coin that has swelling other Shroud-like coins have swelling in the facial area as well. This is one of the main details that should tell you that the creator of these coins is using the Shroud as a model, not vise-versa. “An exact match to the “3” blood-mark on the forehead of the Shroud man.” I really cannot see such a match however hard I examine enlargements of the coins above. Can anyone help? And, is it perverse of me to think that Constantine himself probably did not design the coins personally? It’s amazing that the die-maker was able to portray such small features on the coin. One can see that the “hairs” and the swollen-cheek and the eye are all similar in size, and that all were able to be captured by the die-maker. If one happens to be emperor, it is usually unnecessary to keep a dog and yet bark oneself! I agree Hugh re: the “3” blood mark. It’s the kind of garbage that really undermines the authenticist case. Is this Thomas de Wesselow? Or…..? 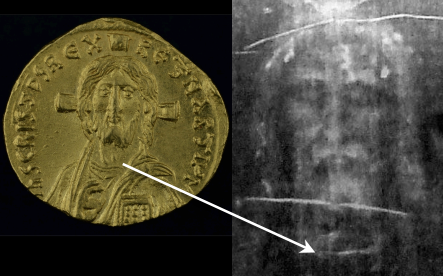 The Shroud-like similarity of the 692 solidus image is discussed at some length in Jack Markwardt’s St Louis paper. Two other very similar images are the St Catherine’s Pantocrator and the Homs vase, all three distinctive as showing an upper body image, all from the first reign of Justinian II, and quite unlike any Edessan-based Mandylion image which more often usually terminate at the neck-line. Markwardt interprets the change in the post-exilic solidi to a younger beardless Christ as a result of Byzantine superstition. Was it appropriate to use the “Image of God Incarnate” in this way? Justinian did not have long to wait for his answer. Overthrown, having his nose cut off, and sent into exile, he interpreted the defeat as a sign of divine disapproval of this use of the image. Consequently when he was eventually reinstated the coin imagery was changed to an idealised youthful and beardless Christ. It is apparent that the Shroud image was known in Constantinople during Justinian’s reign, and in all likelihood was already there. At this time the Mandylion was still in Edessa, but it was Ian Wilson’s contention that its purported full-length image did not become known until after it arrived in Constantinople in 945. The weakness in the Wilson argument then becomes apparent. The Shroud was never the Mandylion. Even Mark Guscin in his PhD thesis seems to become confused by the prevalence of face-only images and reports of a pre-945 full-body image. The two images are evidently quite distinctive from each other. it is also Markwardt’s contention based on the Tarragon manuscript, that following a series of continuous earthquakes during the mid-8th century in Constantinople, the Shroud was hidden away in the imperial palace, only to be revealed by a later emperor Alexios around 1200. He claims that this accounts for the apparent disappearance of the Image of Camuliana from the records after about 745 and which he asserts was actually the true Shroud. It is apparent that the Shroud image was known in Constantinople during Justinian’s reign, and in all likelihood was already there. Not necessary. Edessa at that time was still a part of Byzantine Empire. At this time the Mandylion was still in Edessa, but it was Ian Wilson’s contention that its purported full-length image did not become known until after it arrived in Constantinople in 945. I disagree with Wilson at this point. I suppose that some privileged people knew the true nature of then Image of Edessa. But for some reason they tried to conceal the truth. And Byzantines after 944 tried to conceal the truth either. This is evident if you look at their expressions re Mandylion and the burial cloths (see the accounts of Constantine Porphyrogenitus and Nicholas Mesarites for example). Although Edessa was nominally part of the Byzantine empire, the Edessans were more oriented towards a Syriac tradition and somewhat resented their Byzantine subjection. 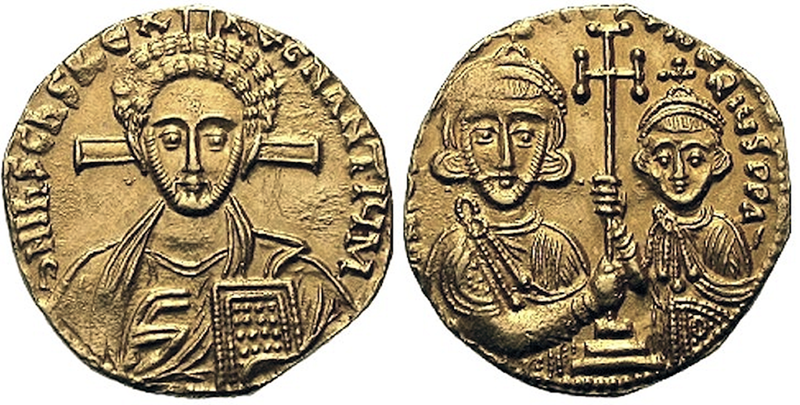 In 639, Edessa fell to the Moslems, whereas the Justinian II solidus is dated 692, when the Mandylion would not have been easily accessible to the Byzantine court. Markwardt in his paper summarises the several scholarly reasons against the Mandylion being the Shroud. O.K. will need to give a satisfactory explanation of the Tarragon manuscript description of the image that was locked away as a result of the earthquakes. It certainly was not the Mandylion which was frequently displayed in public. Fancy tale.It shows how Markwardt conveniently chooses details which fit him, ignoring other explanations. There is in the same glorious city, the face of our Lord Jesus Christ on a linen cloth, made by Jesus himself in the following way, as the Greeks say. The above-mentioned King Abgar was in the city burning with a great desire to see the beautiful face of our Lord. Jesus knew of the king’s desire and so took a linen cloth and wrapped his face in it—the form and figure of his face was imprinted on to the cloth. The Saviour thus sent his face to King Abgar on the linen cloth, so that he might see what he looked like. This wonderful linen cloth with the face of the Lord Jesus, marked by direct contact, is kept with greater veneration than the other relics in the palace, and held in such esteem that it is always kept in a golden case and very carefully locked up. And when all the other palace relics are shown to the faithful at certain times, this linen cloth on which the face of our redeemer is depicted is not shown to anyone and is not opened up for anyone except the emperor of Constantinople. The case that stored the holy object used to be kept open once, but the whole city was struck by continuous earthquakes, and everyone was threatened with death. A heavenly vision revealed that the city would not be freed of such ill until such time as the linen cloth with the Lord’s face on it should be locked up and hidden away, far from human eyes. And so it was done. The sacred linen cloth was locked away in a golden case and carefully sealed up, and then the earthquake stopped and the heaven-sent ills ceased. From that time on nobody has dared to open the case or to see what might be inside it, as everyone believes and fears that if anyone tries to open it the whole city will be struck by another earthquake. The reference of King Abgar clearly provides link to the Mandylion. And as to earthquakes -convenient excuse for keeping the Mandylion closed, and keep its true nature a secret…. Between 745 and about 1200, only the emperor was permitted to open the casket in which the “Image of God Incarnate” was hidden from other eyes. For a special purpose, he might show the image to others in private, but never publicly. Hence it would seem that Constantine VII permitted his mint officials to view the image. Likewise there would be good reason for Bela III of Hungary, then betrothed to the emperor’s daughter and so heir-apparent also to view the image, as appears evident from the HPM, which shows vestigial recollections of this viewing. As I said: Markwardt borrows heavily from Pfeiffer -but disregards the latter’s views on that matter (because they are inconvenient for him). You have understood the situation clearly, that is why I provided a link to Father Pfeiffer’s interview. It provides support for your views. Following that logic it would therefore seem that Justinian II in the year 692 was able to produce a Shroud-like image on his coinage, inclusive of the upper body, despite the Mandylion having been inaccessible to him and under Moslem control for the previous 53 years!!?? One might wonder why he might show any interest in such a relic, unless he had a better alternative more readily available! Ian Wilson wrote about the ‘loros’, a garment worn by the emperor and signifying the Shroud, on the reverse side of the coin. That was his interpretation. Is that information right or wrong? Subject: “The lock of hair on the forehead”. is not very similar to the Manoppello’s Veil. only the eyes seem interesting. Piero, “the Epsilon seems to be mislocated” — on a coin of this size (or any size), the ability of the “artist” to precisely locate something like the Epsilon would have been difficult indeed. I wonder why “experts” sindonists in Art are usually physicians, engineers and amateurs. (My wonder is rethorical).